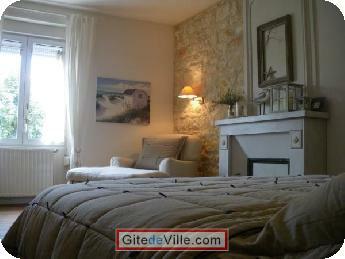 Vacation Rentals - Holiday Rental ads in the city of Saintes in France for Tourism. 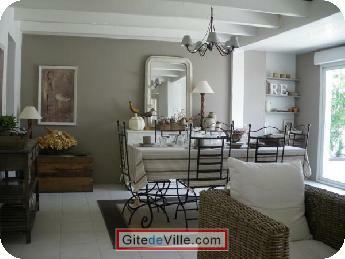 Bed and Breakfast of 125 m² in Saintes for 4 peoples. Our Chambres d’hôtes in the center of the town of Saintes. For your professional or tourist stay in our region, we are happy to receive you in a summer house of 1895 situated on Saintes' right bank of the river Charente. 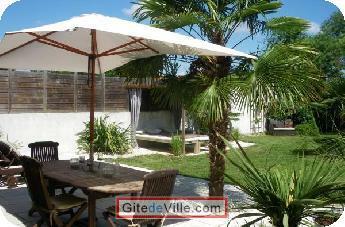 of Rochefort, La Rochelle among others, the magnificent Atlantic Coast and its beaches or the sea resort of Royan. Take advantage of our large dining room, a space of relaxation, and a lounge with its fireplace and television, a free WIFI internet connection, the peace of a mature garden, the terrace and of the barbecue during the warm summer evenings. After you wake, we will be happy to serve you a generous breakfast in the dining room or outside in terrace depending on the weather. We are open all year round and will do everything we can to make your stay with us as pleasant as possible. Gallo-Roman Amphi-théâtre, Roman bow of Gallo-Roman Germanicus, thermal baths, The " Abbey aux Dames" monastic set established in 1047, with its XIth and XIIth century church "Notre-Dame". The Cathedral St Pierre : the bell tower is worth walking the 243 steps, the prize is to ponder over the city! Cathedral Saint Eutrope (World heritage of Unesco in conformance with the "Roads of Saint-jean de Compostel" .Its Cruises on the river Charente, its walks and hikes, its magnificent 18 holes Golf. Leisure activities, culture, history, architecture, gastronomy, restaurants and markets, the city will not fail to amaze you by all its wealth. Last Ads update : 05/05/2011. Owner of an urban accomodation or B&B to rent in Saintes ?